Why did Russia become involved? On the one hand, the more cynical of the commentariat suggest that President Putin simply saw an opportunity for Russia to recover its global profile, but that, surely, is too facile. The Syria intervention, from a Russian perspective, would, from the outset, have been judged a grave gamble: Russia did not want to commit itself deeply; it had no wish to repeat the Afghan experience. It proposed rather, to turn a geo-political tide: with never more than 35 aircraft deployed to Syria, a string of advisors, and on the basis of long and vulnerable supply lines (should matters have taken a turn for the worse). More than that, Russia’s leadership would not have known how the Americans might react. It was an audacious move. So, why do it? Was it just to raise Russia’s profile? I doubt it. Instead one must rather look at the context: the Cold War ended with an American outpouring of triumphalism (the ‘End of History’), rather than a more sober attempt to set the architecture for a collaborative post-Cold war security framework. In fact, the West transitioned from traditional Cold War to a new hybrid war against Russia, aimed at consolidating America’s uni-polar moment (recall that the American authors of this uni-polar ‘vision’, such as Paul Wolfowitz, saw the prospect as wholly contingent on Russia’s absence from the Middle East). On the one hand, Russia was to be cornered, right up to, and onto, its frontiers by NATO; and on the other hand, prominent American neo-conservatives, such as David Wurmser, in the 1990s, were insisting that old ‘Soviet puppet states’ – the Ba’athist and the secular nationalist Arab states - had to be purged from the ‘new’ Middle East. Wolfowitz suggested that Russia’s absence from global politics provided the US a short window of six to ten years (but no more), in which the US might instantiate its uni-polar project via a radically restructured Middle East. In short, as Russia continued to try to coax Washington towards a collaborative security architecture (particularly in the wake of 9/11), the latter resorted more and more, to hybrid, ‘colour’ warfare in Russia’s former Soviet neighbouring states, and to ‘real’, but unconventional warfare in Chechnya, the Balkans and the Middle East, mounted by fired-up, Sunni jihadists in order to consolidate the American-‘led’, global order. Both ‘colour revolutions’ and jihadists posed a direct and real threat to Russia – albeit coming from very different sources: (‘liberal-colour’, on the one hand, and radical Wahhabi, on the other) -- a pincer action closing on the Russian heartland. Libya, however, was the wake-up call. Moscow saw plainly the strategic incoherence inherent in the western resort to radical jihadism as the primary tool for a regional ‘make-over’ and regime change. Radicalised Sunni Islam was effective at burning the old order for sure, but in so doing, it threatened to set the entire Middle East ablaze, and with it, Central Asia, too. This essentially, I believe was Moscow’s calculus: either take an admittedly big political and military risk by intervening in Syria, or stand and watch the region self-immolate, and then watch the flames then creep into Central Asia, and ultimately to the twenty million Muslims residing in Russia. 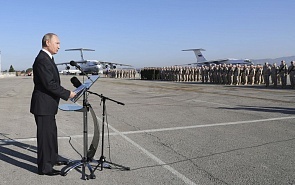 In practice, Moscow had little choice: Syria had become Russia’s ‘front line’, as it were. Well, the gamble paid off: Wahhabism has been discredited (though its kernel - its seed idea - remains). Syria was indeed the ‘pivot’ to the jihadist power-play, and its defeat there has been psychologically searing both for the jihadists, their state sponsors, and the western services, who, behind the scenes, had been pulling the strings. Russia is back politically in the Middle East and, as Paul Wolfowitz correctly foresaw, its return effectively has compromised America’s uni-polar moment. The American Deep State is outraged, and Saudi Arabia is in deep denial over the outcome in Syria. It would like to invert this adverse paradigm by joining with America and Israel in taking revenge on Iran, and thus (it seems to believe), recoup its political and ‘Islamic' standing. The flaw to this plan is that Syria’s survival – despite the monumental effort to tear it down – has produced a new dynamic: radical contiguity across the region’s northern tier. It is not just physical contiguity (open physical borders), but one of political energy, reaching from the Mediterranean, from Lebanon to Syria, from Syria to Iraq, and Iraq to Iran; and from Iraq now to Turkey. It represents an energized, militarily mobilized, critical, political mass. It is a mass which speaks to a fundamental shift of political power from the southern tier of states to the northern tier. And into this tectonic shift – almost unbelievably – the US President has thrown to the Israelis a bone: Jerusalem as its capital, and the move of the US embassy into the corpus separatum city -- the (holy) city that was to enjoy special status, be open to all, and be administered by the United Nations. Was Trump aware that ‘Jerusalem’ is not mere ‘real estate’ (as Jared Kushner characterised the essence of the conflict with Israel), but a symbol that stirs blood and arouses hot passion for Muslims everywhere (there is barely a house in the region that does not contain an image of Al-Aqsa mosque in the Haram Al-sharif - the sacred sanctuary). I remember President Arafat telling me that it was precisely this issue of Al-Aqsa and its sovereignty, which sank the Camp David talks, just as he had earlier forewarned me that it would. We do not know whether Mr Trump was essentially planning to please his evangelical and far-right supporters by this declaration, demonstrating how different he is to past Presidents, through keeping his promise. Mr Pence, closely allied with the Evangelical base, positioned in the background, might support this hypothesis. Or, maybe violent anti-Americanism on display in the Muslim world was thought to reinforce the cultivated image of ‘Judeo-Christian’ American culture under attack, and thereby stiffen Trump's base. Perhaps however, he viewed handing Jerusalem to Israel as its capital, as some ‘Art of the Deal’ reality play. We shall have to see. In any event, if intended as a negotiation play, it will likely prove counter-productive: there is no peace-process to be ‘damaged’, but President Trump effectively has declared ‘a war’ of sorts: a highly emotive and symbolic struggle for Al-Aqsa and the ‘Holy City’ of Jerusalem. This is more powerful than just the Palestinian cause: it trumps it. And it represents an image (a struggle for Jerusalem) that will bind Shi’a and Sunni; it will reanimate Islamists everywhere, and will undercut Arab leaders seeking to align with Israel — and it will strengthen Iran (who holds legitimacy and credibility on this issue). It is just the issue around which all the strands of Middle East politics can gather. Pay little heed to street protests: this will not be so much about street violence (though there will be some). It portends rather, the beginning of ‘a long struggle’ – and, one long expected.